On an early morning in August I’m sitting on the beach in Stone Harbor, New Jersey. As I look up from the pages of my book, there is nothing between me and the horizon but the Atlantic Ocean. The only sound is the rhythm of the waves pounding against the shore while gulls and sandpipers wheel across a cerulean blue sky. Peaceful and calm, my mind is at ease. That morning I was reading “Blue Mind,” a new book by Wallace J. Nichols about how an ocean can affect our minds, bodies, and overall health and sense of well-being. Through breakthrough neuroscience (explained in layman’s terms) and compelling personal stories, Nichols weaves a captivating tale on the rejuvenating power of water. It makes us healthier and happier, reduces stress and brings us peace. 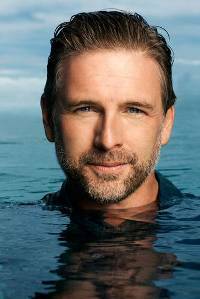 Several years ago– Nichols, a marine biologist and conservationist– started an annual conference that brought together ocean and brain scientists, biologists, surfers and artists to explore the positive effects of water on our health. He called it “Blue Mind.” Now Blue Mind is a book, one that has quickly climbed up the New York Times Best Seller List. The forward to the book is by Celine Cousteau, Jacques’ granddaughter. 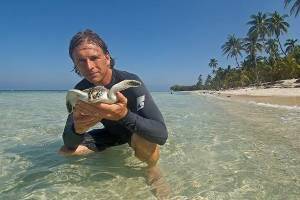 Nichols has spent much of his professional life studying sea turtles of the Pacific Ocean and working with fishermen in Baja, California to protect the turtles from poachers. Now he’s exploring the scientific reasons for why humans have such a deep connection with the deep blue. 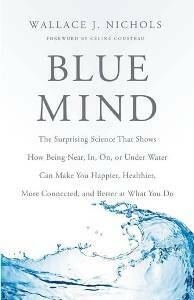 In its simplest terms, blue mind is about the mildly meditative state our brains enter when exposed to water. “This is what you want if you’re in the midst of a stressful week, you just want to hit that big blue reset button and get out here,” says Nichols, 45, who grew up near the Jersey shore and today lives north of Santa Cruz near the central coast of California. Water, the most omnipresent substance on earth, and with air comprise the primary ingredients for supporting life. Our bodies consist of about 60 percent water and our brains, a whopping 75 percent. “So when you see water, when you hear water, it triggers a response in your brain that you’re in the right place,” Nichols suggests. Positive reactions in the brain have been observed in subjects who are simply shown pleasant nature views but it is especially the coastal views that activate the brain’s reward system. Using insights derived from biology, evolutionary geology, medicine and brain science, Blue Mind is an exploration of the deep human attraction to water and how understanding it can lead to a greater insight into personal happiness. Nichols says neuroscientists have studied how everything from chocolate to red wine affects the brain, but they’ve somehow overlooked the single greatest feature on the planet. Experts at his annual conference have explored how being near the ocean can achieve the same stress-relieving effects of meditation and how the ocean ignites our emotional senses. “This isn’t a novel idea by any means, but our ability to connect the dots on the science is revolutionary,” he explains. Blue Mind does not come off as a dry science book. While Nichols is comfortable with complex neuroscience concepts, the book is not bogged down with the details of research. I thoroughly enjoyed the personal stories of the surfer, swimmer, sailor, diver, kayaker, paddle boarder, fisherman and those who sometimes risk their lives working on the water. Nichols points out that water therapy is increasingly being used to treat a variety of ailments, including drug addiction, autism and post traumatic stress disorder suffered by veterans. Nichols contends that planet “Earth” is misnamed. Which brings us to his Blue Marble Project. It began on Jacques Cousteau’s 100th birthday in 2010 as a simple way to make his ocean message true and memorable. After a presentation in the New England Aquarium’s IMAX theater, Nichols gave everyone a blue marble to pass along with a positive ocean protection message. The marble represents the earth from one million miles away in the spirit of Carl Sagan, Stuart Brand and the Apollo astronauts. 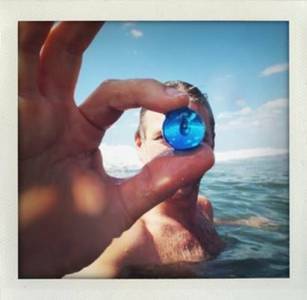 Today, Nichols estimates there are as many as a million blue marbles in circulation in celebration of our beautiful, but fragile, blue planet.